The economy doubles since 1980, but wages flat. EVEN THOUGHT YOU WON'T BE ABLE TO SEE, EYE 2 EYE, WITH THIS DUDE. HE IS A COMMUNIST AND A PUPPET FOR THE N.W.O. HE "IS" THE PROBLEM! In a perfect economy the dollar value would hold constant and wages would only rise to reward increased value of job performance. What a load of crap. Reich is a socialist who will lie and deceive everyone to get his political beliefs into our government. The capital gains tax is at 15% to encourage people to invest. Investment is a huge part of what makes our economy work. If they raise the tax it will discourage investment. People with money will take it elsewhere. Higher tax rates produce diminishing returns. Reich knows this but does not care because he is only interested in the short term benefit to a socialist cause Long term if the economy tanks it helps the socialist cause because lots of unhappy out of work people get angry and demand change. Guess what system they want to change to. 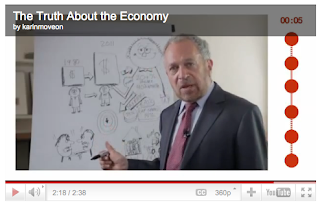 Robert Reich is a Keynsian, and hence totally wrong! The problems are debt based money growing exponentially, an entitlement mentality so 45% +/- of the federal budget is spent to give people "free money", except it's not free! It is borrowed money. Now taken together, borrowed, fiat money, the outcome can only be exponential debt growth. That always ends in catastrophe. End the Fed and cut entitlements!!! But alas, it's too late. This baby is going down!